Us GIMP users tend to be left a bit out of help, cause most use Photoshop for their image manipulation. 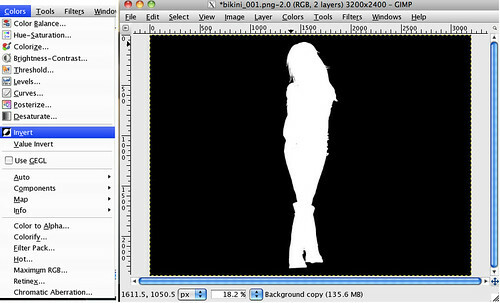 However GIMP is a pretty powerful and freely distributed raster image manipulation program. Not long ago I found a tutorial for compositing with Photoshop. The tutorial is pretty good, but obviously it doesn't help all the way with GIMP. In the following I will describe how I removed a background with GIMP from an image I took in SL. You can see the before and after shots below. First of all I took the pic, using a slightly grey, full bright background. I used the grey one, because often a white one doesn't play nice. Some like to use a bright green background. This is one of those things you need to try yourself to see what works best. Next I created a black and white version of my image. To do this you can use the windlight settings from the tutorial I mentioned earlier. I did this a bit different way. I duplicated the background layer of my image and chose Colors > Desature... and clicked OK.
Then I chose Colors > Brightness-Contrast... and moved the contrast slider to it's max (127) and the brightness slider to -79. Please notice the amount of brightness depends on your picture, so you need to try and see which setting is the best. Now I had created a black on white image. In order to make my evil plan to work I did need it to be white on black. So I chose Colors > Invert. After creating this image with white silhouette on a black background, I copied it and made the layer invisible by clicking the eye next to the said layers thumbnail. After this I made the original image layer active by clicking it and chose Layer > Mask > Add Layer Mask.... From the pop up I chose White (full opacity) and clicked Add. 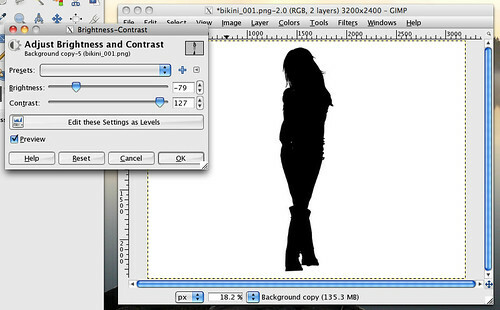 I could see the mask appearing on the layers list as a white rectangle next to my original image. Right after doing so I pasted the white on black image I had copied before, which now appeared on the layers list as a Floating Selection (Pasted Layer). The image had now a transparent background. I right clicked this floating selection on the layers list and chose Anchor Layer from the menu that popped up. The white on black image replaced the white rectangle on the layers list. I right clicked on that layer and chose Apply Layer Mask. After all of this I could copy and paste my image on a background of my choosing! Oh, by the way, the style credits will follow later. 6 comments for "How to remove a background with GIMP"
Wooo, thank you again! Me and background removing weren't friends before. I'm so happy if I can help! Ihanaa, en malta odottaa, että pääsen kokeilemaan. Ja vieläpä uudella koneella, jonka sain vastakoottuna keskiviikkona.